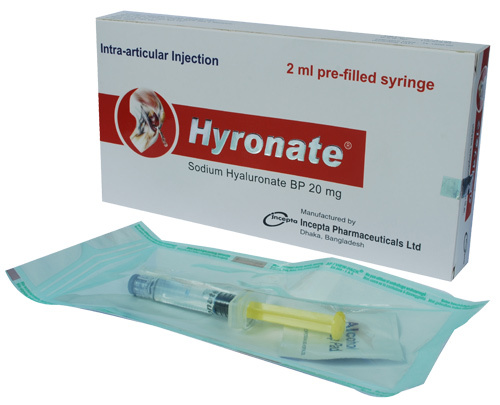 Hyronate Injection: Each pre-filled syringe contains sterile, non-pyrogenic Sodium Hyaluronate BP 20 mg as solution. Sodium Hyaluronate is a viscous solution consisting of a high molecular weight fraction of purified natural sodium hyaluronate in buffered physiological sodium phosphate. It has a pH of 5.5-7.0. Hyaluronic acid is an important component of the body's extracellular matrix and is present in a particularly high concentration in cartilage and synovial fluid. Endogenous hyaluronic acid provides viscosity and elasticity to synovial fluid, which is fundamental for its lubricating and shock absorbing properties. It is essential for the correct structure of proteoglycans in articular cartilage. In osteoarthritis there is an insufficient amount of and a chance in the quality of hyaluronic acid in synovial fluid and cartilage. The intra-articular administration of hyaluronic acid into arthritic joints with degenerating cartilage surfaces and pathologically altered synovial fluid improved functions. Sodium Hyaluronate is indicated for the treatment of pain in osteoarthritis (OA) of the knee in patients who have failed to respond adequately to conservative nonpharmacologic therapy, and to simple analgesics, e.g., acetaminophen. Sodium Hyaluronate is administered by intra-articular injection. A treatment cycle consists of five injections given at weekly intervals. Some patients may experience benefit with three injections given at weekly intervals. Inject the full 2 ml in one knee only. If treatment is bilateral, a separate injection should be used for each knee. The common side-effects include gastrointestinal complaints, injection site pain, knee swelling/effusion, local skin reactions (rash, ecchymosis), pruritus, and headache. Use caution when injecting Sodium Hyaluronate into patients who are allergic to avian proteins, feathers, and egg products. Strict aseptic administration technique must be followed. Remove joint effusion, if present, before injecting Sodium Hyaluronate. Do not use the same syringe for removing joint effusion and for injecting Sodium Hyaluronate. It is recommended that the patient avoid any strenuous activities or prolonged (i.e., more than 1 hour) weight-bearing activities such as jogging or tennis within 48 hours following the intra-articular injection. The safety and effectiveness of Sodium Hyaluronate have not been established in pregnant women. It is not known if Sodium Hyaluronate is excreted in human milk. The safety and effectiveness of Sodium Hyaluronate have not been established in lactating mother. The safety and effectiveness of Sodium Hyaluronate have not been demonstrated in children.